Ever wondered what happens to your rubbish and recyclables once they are picked up from your kerb? As our landfill space is becoming less and less available, there has been a push from the NSW Government to identify alternative ways to sustainably dispose of our waste. As of July 2017, Council’s kerbside red-lid bin waste, including food waste, has been processed through a new Mechanical and Biological Treatment (MBT) facility. This is one of several landfill diversion strategies that Council is undertaking in order to meet our target resource recovery rate of 75% by 2020. The MBT has allowed Waverley to bump up our recovery by about 30%. Learn more about all of our initiatives to reduce landfill waste and increase resource recovery in our Sustainable Waste Strategy. The red bin waste is collected at the kerbside and transferred to Veolia’s Woodlawn location. The waste is then loaded into the MBT, which is an enclosed system where various recyclable items mistakenly placed in the red bin and other contaminants are separated out. The remaining material is turned and air and water is added. Any methane gas produced in this stage is harvested and sent via pipes to create energy for 10,000 homes..
Once the material leaves the MBT process, it is piled into a large warehouse to age and ferment. 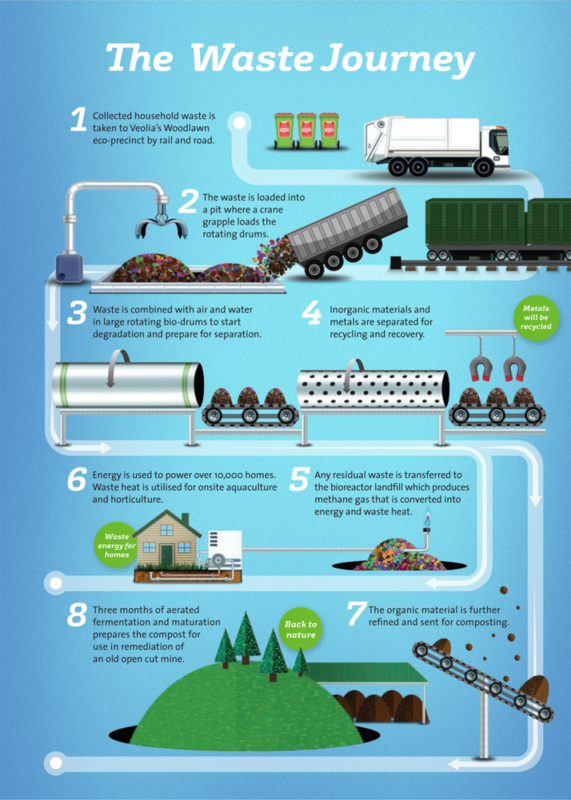 This process creates a mixed waste organic material similar to compost that is used to rehabilitate an old mine site. Any residual waste that is not compostable is sent to landfill. The MBT technology is new to Australia and is still being tested. It is not a perfect system, therefore it is most important to separate recyclables and place them in the recycling bins. On the 26th October 2018, the NSW EPA announced a regulatory change that has suspended the practice of applying processed mixed waste organic material to land for mine site rehabilitation until further controls can be considered. Following the announcement by the NSW EPA, Council staff has been working closely with its contractors and the NSW EPA to confirm processing arrangements for general waste to ensure that contract requirements continue to be met and the principles of responsible, best practice waste management are applied. Council’s waste and recycling collection services will continue as usual. However waste diversion from landfill rates for general waste collected in 2018 will be temporarily affected by the change in regulation. Waverley Council collects glass, plastic containers, steel cans, paper and cardboard for recycling purposes. Containers are collected in the yellow bin and paper is collected in the blue bin. If you are a school or a commercial business you may have a comingled recycling service which includes the collection of both containers and paper together. The contents of our yellow bins are transported to a Material Recovery Facility (MRF), operated by VISY at their Smithfield location, where they are sorted, separated into different streams of products, and squashed into large bales to be resold through global commodity markets. A plastic bottle placed in your yellow bin may end up as a sleeping bag, a plastic chair or even a pen! Buying items that are made of recycled content helps to support material reuse and recovery. The paper collected in the blue bin is directly transported to the paper mill at the Smithfield location, where it enters a process (without any sorting) and is made into new paper. Why is the media talking about a recycling crisis? Since early 2018, off-shore markets including China, Malaysia and India have tightened the requirements for what they will accept as recyclable imports from overseas markets, including Australia. China now requires a cleaner and more processed version of recyclables. This does not stop recycling altogether, but has impacted how much recycling Australia can send overseas. After your bins have been emptied, the contents are taken to the Visy Material Recovery Facility where they are sorted into the various recycling streams. Visy can process high quality plastics and paper/cardboard in their processing plants in Sydney. Other materials from the kerbside recycling bin are exported to countries that have facilities to process these materials. In general, the overseas processor pays to buy our recyclables, however prices for mixed paper and plastic (unsorted) have plummeted due to the more stringent quality restrictions. It is important to note that the majority of Australian recycling is processed within Australia; only 10% was sent offshore in 2016-17 according to National Waste Report 2018. What can I do to make sure my recycling efforts are worth it? The ideal choice is to reduce the amount of packaging you purchase in the first place. With the packaging you can’t avoid, the bottom line is that for recycling to be processed into raw materials for new uses, either in Australia or offshore, the materials need to be separated and uncontaminated. Currently, between 10 and 15 per cent of kerbside recycling cannot be recycled because it is contaminated with non-recyclable items such as soft plastics, or newspapers still in their plastic bags. If every household contributes to this process, then the maximum amount of plastic, glass, paper and metal will be recovered and recycled. You can make a difference! Contamination occurs when there are items placed in the recycling bins that are not meant to be there. Common contaminants include nappies, plastic bags and other soft plastics, textiles, food scraps, and e-waste. These materials can cause issues for workers and machinery at the MRF and can also impact the fees that Council pays for waste disposal. The MRF cannot effectively separate all types of contaminants. In cases where there is high contamination, the entire recycling load may have to be sent to landfill. Plastic bags or other soft plastics can cause issues with the MRF sorting equipment and should never be placed in your yellow or blue bins. All recyclables should be loose inside the bins. Our garden organics are delivered to the Veolia Port Botany Transfer Station and from there, the organics are transferred to Australian Native Landscapes and used in fertiliser/soil conditioners. If you have any specific questions, please contact customer service at 9083 8000.